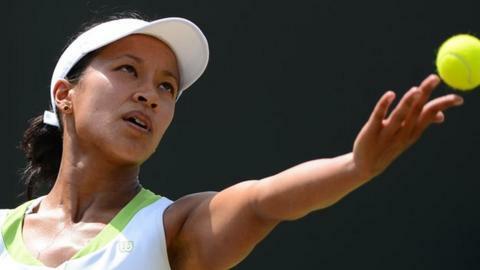 Former British number one Anne Keothavong has retired from tennis to pursue a career in broadcasting. The 29-year-old reached seven WTA semi-finals and, in 2009, became the first British woman in 16 years to be ranked inside the world's top 50. Keothavong will join BT Sport's tennis coverage team later this year. "I think I am leaving tennis in excellent shape with both Laura Robson and Heather Watson leading the way for Britain in the women's game," she said. Keothavong won a total of 20 singles titles on the International Tennis Federation circuit, the level below the top-tier WTA tour, and eight ITF doubles titles, reaching a career-high singles ranking of 48 in the world in early 2009. In Grand Slams her high point was reaching the third round of the US Open in 2008, while at Tour level she reached the last four in 2009 in Warsaw, which was the best British result at a Premier level clay-court event since Jo Durie was a semi-finalist at the 1983 French Open. Keothavong said: "I have given my decision a lot of thought and I believe this is the right time to move on to the next stage of my career. "Anne Keothavong showed wonderful persistence throughout her career, and refused to admit defeat to those troublesome knees. Just when we thought it was time to move on from her generation of British female players, both Keothavong and Elena Baltacha forced themselves into the world's top 50. "However, Fed Cup captain Judy Murray might be less well dressed as a result of Anne's decision: she's paid tribute to Keothavong's commitment, professionalism... and valuable fashion advice." "I have had some magical moments along the way and I would like to thank my family for their unwavering support and encouragement, the LTA for their fantastic backing, my coach Jeremy Bates and also Nigel Sears, who have both been very influential in my tennis career, and, of course, the great tennis fans in Britain and all over the world." Keothavong made 13 consecutive main draw appearances at Wimbledon despite her career being threatened by serious injuries to each knee. LTA chief executive, Roger Draper, said: "Anne has been a true ambassador for British tennis, both on and off the court during her entire career. "Anne's courage was evident in coming back from not one, but two challenging knee surgeries. A journey that began on the park courts of Hackney led to her being an inspirational role model for young girls everywhere, as well as to our current generation of players. We wish her well in the next chapter of her life." Britain's Federation Cup captain Judy Murray added: "It's been a real pleasure for me to work with Anne as part of the Fed Cup team. You couldn't ask for a better, more committed team member - a great professional who represented her country with huge pride and passion."